I downloaded a CHM file. When I double click it it prompts me to open / save / cancel. Whether I open or save a new copy, the 'new' version will prompt the same open / save / cancel popup ad infinitum. BTW, the button is also missing for .exe files. I'm using Win7 64bit. Any ideas? Windows keeps the flags in an alternate data stream which is only available under NTFS. The alternate data streams will survive copies from one NTFS folder to another, but they don't survive being moved to a FAT32 or ExFat volume. or being emailed or zipped. Move the file to an ExFat or FAT32 volume, and then, optionally, back to NTFS if that's where you need the file to reside. Insert the file into an Office Document as an Object, copy the inserted object and then paste into Explorer. If it still doesn't work, move the file to a different disk and reopen it to see. CHM files are only blockable (and thus unblockable) on NTFS filesystems. Probably all other sources of files (except network shares in the local zone) are considered unsafe. Not the answer you're looking for? 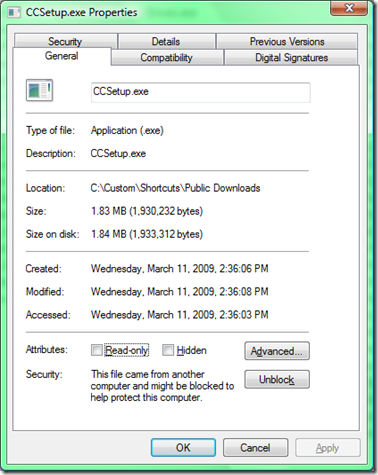 Browse other questions tagged windows-7 security chm or ask your own question. 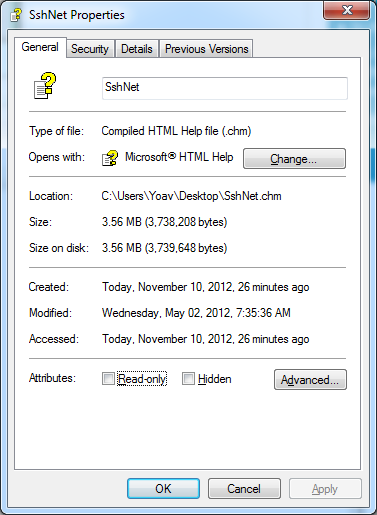 Where is “Confirm open after Download” checkbox for file types in Windows 7?